Our team of Teaching Artists are not only skilled performers, but also skilled communicators as Teaching Artists. Meet the team! Iris Wei is a violinist, Teaching Artist, and designer of the “Stories and Music of Resilience” curriculum! Iris is on faculty and Strings Department Chair at the Merit School of Music, and has performed with groups such as the Northwest Indiana Symphony Orchestra, New Philharmonic, Rockford Symphony, and the Civic Orchestra of Chicago. Also a pianist, Iris switched her main focus to violin after being accepted as a scholarship student at Roosevelt University’s College of Performing Arts in Chicago, Illinois, where she completed her Bachelor’s Degree in Performance. Aside from making music and teaching, Iris is an avid distance runner, eater, and dog lover. Tom Clowes is a Chicago-area cellist and teacher, and founder and Executive Director of Crossing Borders Music. Tom was a student of internationally acclaimed cellist Wendy Warner, former Detroit Symphony Orchestra Principal Cellist Italo Babini, and Lawrence University Conservatory of Music Professor Janet Anthony. 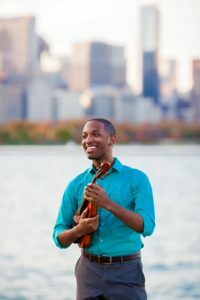 As a member of the Civic Orchestra of Chicago, he played under conductors Riccardo Muti, Peter Oundjian, and Cliff Colnot. In the summers, he teaches at the Ambassadors Music Institute in Croix-des-Bouquets, Haiti. Before moving to Chicago, Tom was a member of the Tucson Symphony Orchestra. He teaches at the Chicago West Community Music Center of Garfield Park. Maya Shiraishi left her native Japan to attend Roosevelt University’s Chicago College of Performing Arts, where she received an Artist Diploma under the guidance of Jasmine Lin, Grammy-nominated violinist of the Chicago Chamber Musicians and Formosa Quartet, and studied chamber music under Shmuel Ashkenasi, founding violinist of the Vermeer Quartet. As a member of the Civic Orchestra of Chicago, she collaborated with Yo-Yo Ma and played under conductors such as Riccardo Muti, Carlos Miguel Prieto, and Sir Andrew Davis.